Don’t give up. Keep disciplining – training – correcting, encouraging and instructing your children. Even when it seems to have no effect. Do not let your mind cross the line and deem it hopeless. At the same time, discipline has to be differentiated from mere punishment. Discipline includes training, loving guidance and instruction. Showing your child how it is done and coming along side him or her to help them grow and mature and do well. Mere punishment will make a heart hard, resentful, and will make you enemies of each other. How many truly tragic stories revolve around the failure to distinguish these two. Think of the way in which our Heavenly Father shapes and molds us, never resorting to mere punishment. How He gives us His Word. And then not only supplies it to us, but then gives us infinite helps to better understand and master it. Teachers and preachers, commentaries and devotionals. Biographies of godly men and women and a rich and massive history of the Church. Then add those who come along side us who have known and walked with Christ before us and for many years. And the amazing gift of the prayers of those around us, and not least of all but highest indeed, the never ending and always perfectly tuned intercessions of Christ Himself on our behalf. Now transpose that to interacting with our own children. For what is our goal in discipline? Not mere to make them feel the sting of poor decisions – though that is an ancillary factor – but to train them and encourage them to do better. 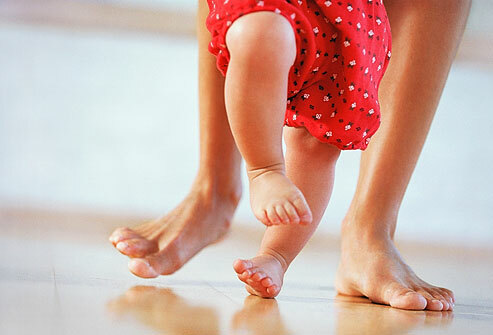 When an infant is learning to walk, think how one holds their little hands and supports them in their faltering first attempts. How patient we are. How filled with smiles and constant encouragements of “come on, you can do it, that’s it! Come to Mama, come to Papa, I’ll catch you, you won’t fall…” How much we invest in them growing and mastering this essential of everyday life. And when they fall or stumble – do we then kick them, or castigate them or berate them? No! We want them to do this and learn to do it better. We kiss their wounds, not inflict new ones. We hold them closer and encourage them all the more. Now would we imagine for one moment that our Heavenly Father does one iota less for us as we learn to walk in uprightness and holiness? Do we think Him mean and rigid, impossible to please and irate because we still stumble and fall while learning how to take on fully the image of Christ Himself? Does He not know what it takes to grow? Is He not on our side in it? Is His Word not filled to overflowing with encouragements and tactics and techniques and hints and corrections and instructions for every new challenge? Does He not have our very best in His heart? Does He not provide His Spirit to indwell us and Christian brothers and sisters to walk with us and every means at His disposal to bring us to maturity? Here is life in Christ expounded for us in large and glorious ways. He disciplines in teaching and correction – for there is hope! He does not set His heart on giving us up or over to our failures – to death. He is our Father. And He will love us into Christ’s image, and never beat us into mechanical conformity.